Easter Vigil Mass Saturday Apr 20 at 8 PM.....Easter Sunday Apr 21 Mass at 9:30 AM, 11.30 AM and 1:30 PM. Sin never shows itself in pure form—as raw evil. If it did, its ugliness would repulse us. Rather, it masks itself and hides under the guise of something good or attractive. This is how temptation works. The snake did not say, "Eat that fruit and you will be ashamed of yourselves and alienated from God." Rather it says, "You will be like gods." Now that's attractive! Satan came to the Lord Jesus in the same way, with apparent goods. You are hungry, make these stones bread; you are the Son of God, prove your trust in him; you could run the world. Jesus was tested in the same way that Israel was tested in the desert (see Deut 6-8). What distinguishes Jesus' response to the tempter from Adam and Eve's, or even ancient Israel's, is that he doesn't get lost in the apparent good, and he confronts seeming truth with real truth. Jesus was tempted like us and he overcame sin not by his own human effort but by the grace and strength which his Father gave to him. He had to renounce his will for the will of his Father. He succeeded because he wanted to please his Father and he trusted that his Father would give him the strength to overcome the obstacles that stood in the way. Luke says that Jesus was "full of the Holy Spirit" (Luke 4:1). When tempted by the devil Jesus did not try to fight his adversary on his own human strength. He relied on the power which the Spirit gave him. Jesus came to overthrow the evil one who held us captive to sin and fear of death (Hebrews 2:14). His obedience to his Father's will and his willingness to embrace the cross reversed the curse of Adam's disobedience. His victory over sin and death won for us not only pardon for our sins but adoption as sons and daughters of God. Bread is not a substitute for God; you must not test God; you cannot trade obedience for power. To truly enter into the spirit of Lent is to grow in freedom, in discriminating wisdom, and in truth. It allows us to see through the cheap attractiveness of temptation and become inclined to the deeper truths that underlie our hearts' deepest, truest desires. Meditation: What in my life attracts or tempts me to substitute truth for comfort, the status quo for conversion, apparent goods for the only true good in my life? Prayer: Lord, it is so easy to be deceived. Give us wisdom to discern truth, and the courage to live that truth in our lives. Additional Mass and Stations of the Cross: Each Friday evening at 7 PM we will celebrate the Eucharist followed by the Stations of the Cross at 7:30 PM. This year we will pray the Stations of the Cross entitled: Everyone’s Way of the Cross. Copies will be available for you at the stations. 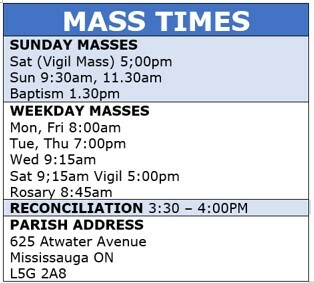 Please join us to celebrate the Eucharist and the Stations each Friday evening. Wishing you all a prayerful Lenten Season! © 2019 All Rights Reserved St. Dominic’s Church – Website: Luis Gomes. Simple theme. Theme images by gaffera. Powered by Blogger.